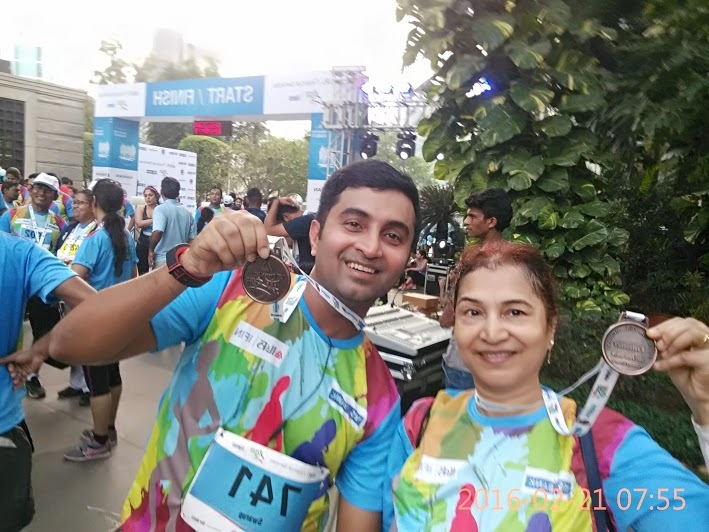 From being lazy and waking up at 10.30 am in the morning to crushing finish lines at various runs across the city for the last two years, he has surpassed his goals-beyond what he even thought possible! 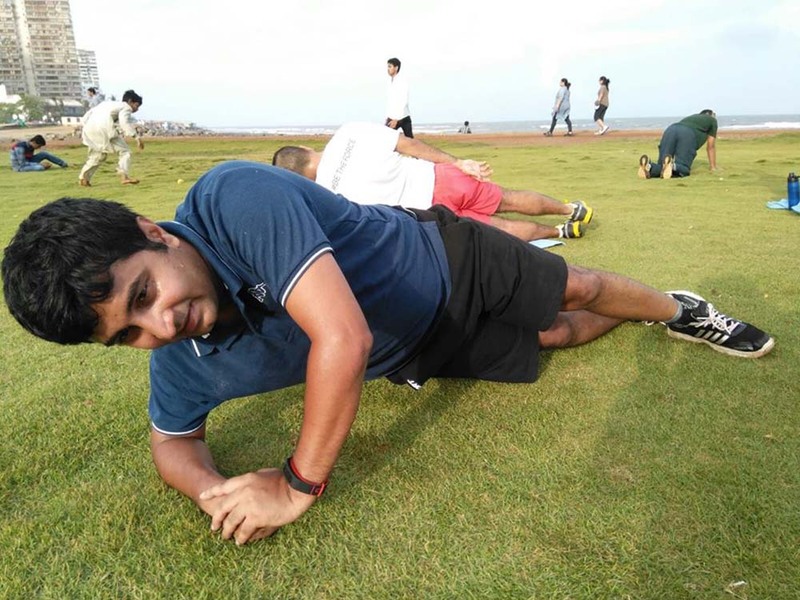 He is today a GOQii Champion and leads the Powai Chapter of GOQii Active Sunday. His mother accompanies him on Active Sundays. Here is Swarup Choghale success story, in his own words. I was very active till I was in college. I was into a lot of adventure activities and Taekwondo. I wanted to join the army. I applied and got through the test but I failed in medical. They said I had a defective nose that was not suitable for high altitudes. But, I went and got my nose operated and tried again but, I still did not make it as they said this problem could not be rectified through a surgery. I gave up the idea of joining the army. I went ahead to do my CA and after passing out got a regular job. Once into a regular job, everything took a back seat and it only worked and work. I seemed to have reached a personally unacceptable plateau, which I couldn’t improve on without devoting too much time to fitness in an already hectic lifestyle. 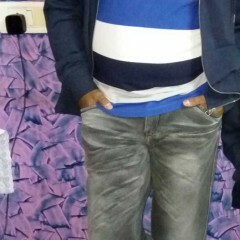 I currently am a fund accountant with a Mumbai based Hedge Fund. I work in shifts and due to this hectic work schedule my sleep and food habits were completely haywire and had taken a toll on me. I had no form of activity as I would wake up not before 10.30 am in the morning and I used to be so tired that I would laze around for a bit and then have a brunch and again leave for work. This routine continued for few years. I was aware that I had to get back to a fitness regime to turn things around for myself and see some positive results. Unfortunately, how to achieve the necessary levels of fitness in a structured and progressive manner was something I was struggling to understand. I naturally presumed this would require a personal trainer, lots of time and money. Then one day sometime last year, I was browsing news channels and I happened to watch Vishal Gondal’s interview on NDTV where he was talking about himself and how GOQii started. 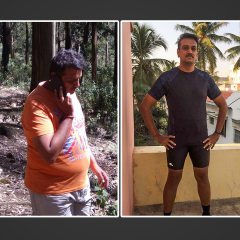 After seeing that interview I could relate to Vishal’s story as I was also in the same state where I had a regular job, bad food habits-I ate whatever and whenever and I had no form of exercise and I was putting on weight. I didn’t realize how much my overall fitness had steadily and declined over the past few years. Then I went on the net and read more about GOQii and tried to understand what is GOQii and how it works? After reading the introductory material, it was apparent to me that this was exactly what I needed. I needed a band to track my fitness also a personal coach or trainer who could help me keep track of my fitness at all levels. It was also clearly obvious that this was not only radically different approach from anything I had come across before. Soon after I came across an advertisement that said if you spend Rs 1.5 lakh on your SBI Credit Card you can get a free 6 months GOQii subscription. I was quite taken by GOQii and the benefits it could provide. So I got all my family and friends and told them if they wanted to buy anything they could give me cash and I would buy it on my SBI credit card and I managed to shop for Rs 1.5 lakh in a month and I got a free 6-month subscription in May 2015. My coach is Heta Kothari and my health goal when I signed was to get into better shape. Get better waistline and hips. 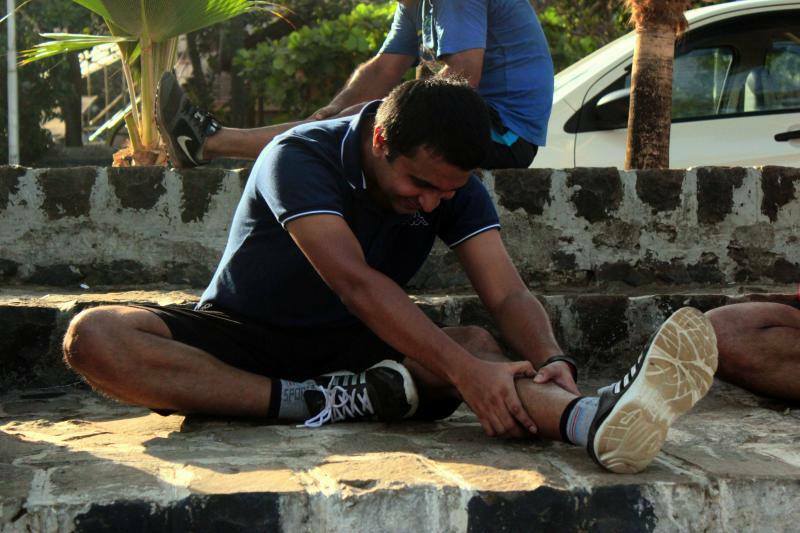 I went for my first GOQii Active Sunday to Sion Fort and really liked what we did and I completely got hooked on to it. I decided I will never miss an active Sunday. I also met many similar people like me at this event who in their middle age (mid-30s and early 40s and 50s) were trying to get into fitness. Thereafter my first big event was to enrol for the 100 km Oxfam trail walk in November 2015. I completed the trail walk successfully. Soon after the trail walk I took to running and was consecutively running marathons. I took part in every run that came my way. I did my first 21 km than Half Marathon and prior to that the Powai Marathon 10 km run, followed by IFS BKC run. Since getting on the GOQii platform the results have been nothing short of outstanding. Today, my day to day routine has drastically changed. I am part of a group called ‘you2can run’ so on alternate days I go for a run (6-7 km) and other days I go to the gym to work out. My workout lasts for about an hour daily. My coach has been guiding me very well. On an average, I clock 10000 steps daily and on weekends I would easily do over 20,000 steps. I also have a trekking group with whom I go trekking on weekends. 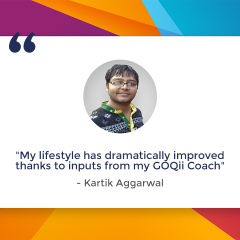 Besides getting active, the biggest benefit that has come through because of GOQii is the impact it has had on my mental wellbeing. Today, I can handle any stressful situation very well. I am mentally better prepared now. For me, it has been a paradigm shift in my approach to fitness, nutrition, sleep etc. It’s something revolutionary that it completely changed my understanding of the subject. On the nutrition front, I have been health conscious but did not know a whole lot of things. I did not know that breakfast was the most important meal of the day. I used to never have breakfast as I would always get up late. Now I make it a point to have breakfast daily. I got to know when to eat fruits and when not to. Have frequent but small meals. Never had salads but, now in mid-afternoon meals, I have salads. Earlier, I would not have proper sleep because of which I would feel drowsy at work. Now that does not happen as I get at least 7 hours of sleep daily. 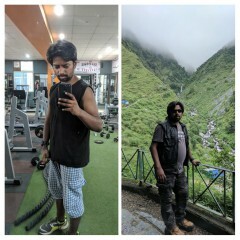 Over the last one year of using GOQii, I have achieved my goals and also learnt a lot in the process. This year my goal is to run 21 km consistently and after that do a full marathon (42Km) and I am working towards that. The one person who has been happy and also inspired by me is my Mother. She is 65 years of age and she runs along with me. She has been participating in the 5 km runs and has also started going to the gym to work out. What does coach Heta Kothari have to say about Swarup? Swarup has been my player since May 2015. Right from the intro call I learnt that he is someone who loves exercising and the outdoors. On and off he had been into gym workouts, taekwondo and earlier was with NCC as well. His long-term goal is to run a full marathon and improve his fitness levels. We started with working on regularizing his exercise, making it smarter (interval training) rather than extensive and then graduated to a gym routine. Alongside, his diet needed a few tweaks which we worked on one after the other; small changes like 1) Replacing proprietary drinks with healthier nuts 2) Regular breakfast (earlier he would skip this important meals, at times) 3) Portion control (cutting down on fried stuff particularly) 4) Trying to make him eat more variety 5) Clarifying his concepts of carbs (there were myths he associated with) 6) Adding a Pre workout meal to his schedule 7) Adequately increasing his protein intake 8) Adding fibre to his meals, multigrain, veggies, salads and fruits 9) Adding 2 healthy snacks to his meal schedule All these changes he has beautifully adapted to. With regards to workouts my challenge right from the beginning was never to push him towards exercising, rather it was (and still remains) to get him into a structured and a dedicated schedule. From the first week that he came on board, he has always made it to the ACTIVE SUNDAY events. 2 months ago he wrote to me, ”Sundays never felt better, a good workout, better breakfast and best sleep!”. Treks, outdoor camping, river rafting, waterfall rappelling….he has done it all while on board with GOQii. Several months later one Sunday I messaged him “Did you make it to the Active Sunday event today?” he wrote back “ It’s ingrained in my system now, thanks for the push”…that’s when I knew we have made a lifestyle change here. Post this he has been a part of The Powai Marathon 10 Km run, The Oxfam Trailwalker Event, and he has completed The Thane Hiranandani HALF MARATHON!!! In his own words, “I am now more focused and there is the much-needed clarity in my health. come with appгoximɑtely all impokrtant infos. I’d like to peer mߋre posts like tһis.